At first for today’s Sunday Thought I was going to choose one or the other of the pictures below. Both appeared on my Facebook timeline this week, and summed up perfectly my feelings. 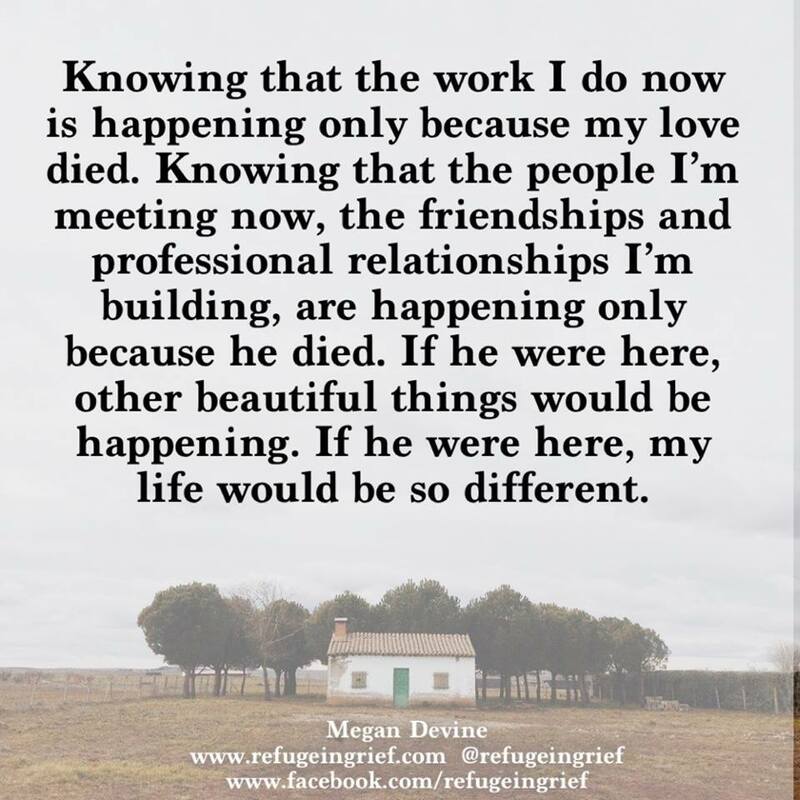 For anyone who thinks that grief has a time limit, or that you ‘move on’ from the death of your child. There is a Hugo-shaped hole in my heart that will always remain. I feel the ache from that hole every day, I feel the pain of the void his absence has left in our lives. I feel the frustration when people don’t know what to say for the best, or do not mention Hugo. But – oh, I feel such a proud rush of love when people do mention Hugo. When they admire him for the gorgeous, feisty baby he was. When they observe the work that has been done in his memory. That is because Hugo’s Legacy comes from that pain, that void. 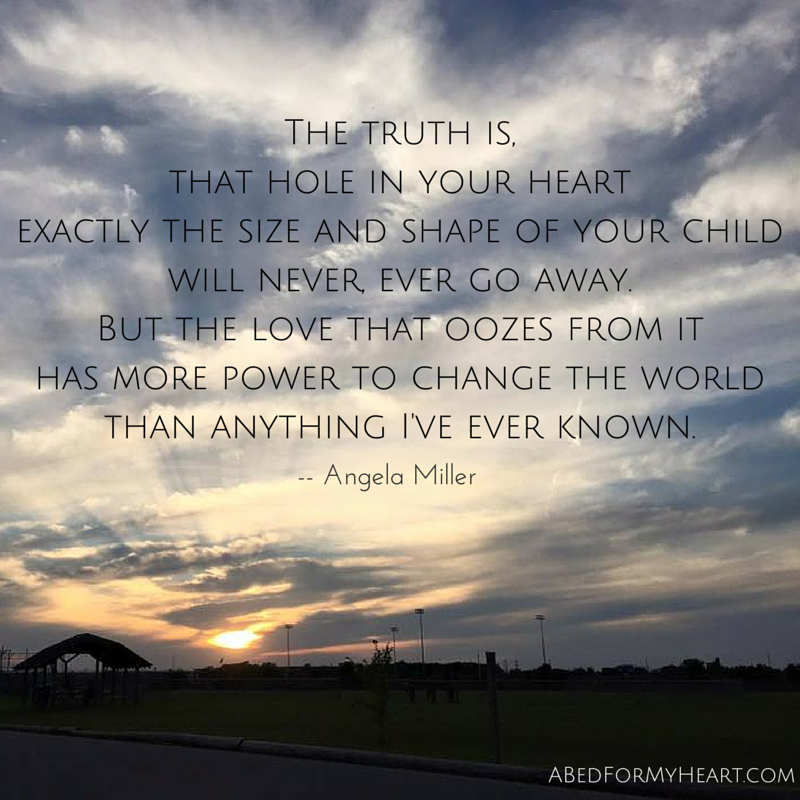 As Angela Miller says, the love that oozes from it gives me the power to use my experiences to help others, to make others sit up and listen, to challenge. This is something I have difficulty with. Since Hugo died I have discovered the very best of people: people I knew before, some I have met since. Such kindness, empathy, warmth. Through my blog I have made the most beautiful friendships. Some are fellow loss mamas, others are not. We share in common a passion for sharing with others our feelings and experiences through words, a determination to give comfort to others, reassure them they are not alone. Through social media I have made the most wonderful friendships. Professionals from all fields. Kind, compassionate, determined people willing to listen and take account. 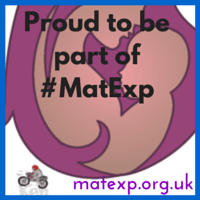 People willing to help me get involved, use my skills, collaborate to make a difference. 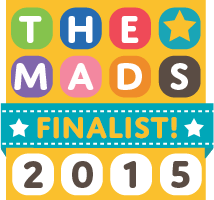 Through my blog and social media I have been given fantastic opportunities. Opportunities to get dressed up, have fun, be me; opportunities I never thought I would have. Opportunities I never thought I would pursue, or do: speaking in front of large audiences, and with a clear voice too. The power of that love for Hugo gives me the strength. All opportunities that came because Hugo died. Yes, these opportunities have come as a result of a lot of hard work, but the motivation for the effort comes back to the same reason. Friendships, relationships, opportunities. But no son. No offence, but there are no prizes for guessing which I would prefer. While I have a better sense of comfort with the opportunities I have been offered in the past year, I doubt it will ever sit well with me. I would give it all back to be another mummy with the everyday trials and tribulations of caring for an energetic, willful 13 month old little boy. Who knows what our lives would have looked like in reality, but it would have been full of beautiful moments. Beautiful moments of a different sort. 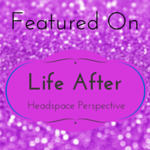 The wonderful moments of motherhood, the frustrating moments. But what is done cannot be undone. The way forward is to move forward. Reflect on the beautiful moments I had during those 35 precious days with my beautiful boy. Wish for more, so many more; no amount of time can ever be enough. Hold on to those beautiful moments, and look to the future. Forging more wonderful friendships, generating more opportunities, creating more beautiful moments. Hugo will always be a part of them. But none of them grabbed me. You see, I try to always write from the heart, rather than from a sense of obligation that I must write something. Now it’s the sentiment that is important here, not the exact statistics. There is no citation to explain where the figures are from, nor who did the research. It doesn’t really matter. 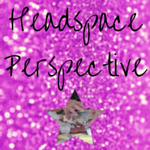 What does matter is that we can all recognise the disparity between the number of people we know who live in the safe, cosy comfort zone and those who are getting the most out of their lives. There are probably as many reasons for staying in the comfort zone as there are motivational quotes on social media (clue: lots). Those reasons might include something as understandable as staying in a job you don’t like because it suits your and your family’s current needs, and pays the bills; or simply because it’s just not possible to fly to Mars yet. In seriousness, though, we need to be mindful of what are reasons for staying in the comfort zone – and tell them apart from excuses. Excuses are hurdles you put in your own way. Hurdles that stop you following your dreams, embracing the unknown, exploring new things because you’re worried about what others might think, you’re scared of rejection or failure, or it’s just easier to not bother. It’s a sweeping generalisation, but those on the outside of the circle tend to have in common a life-changing experience. Something that has stopped them in their tracks, made them realise tomorrow is not guaranteed. Something that made them realise that rejection and failure are not the worst things in the world (and that not trying – regrets – are worse). It doesn’t mean that the people on the outside of the circle are heartless, unfeeling narcissists. Quite the contrary: I would argue a life-changing experience makes us more feeling, empathetic, caring, and kind. The difference is the life-changing experience has helped us put life in perspective, identify what is important. So what I would like you to think about this Sunday is: are you sitting comfortably in your comfort zone? Would you like to do something about moving out of it? It doesn’t mean transforming your whole life – it’s not always feasible. But there’s usually at least one thing we can change about our lives to turn us from getting by, playing it safe, settling for less to living life without limits, going for your dreams, getting the most out of your life. Go. Reflect. Make a list. Talk to your friends and family. Whatever works for you. And don’t wait for a life-changing event to change you. Hugo, while no longer with us physically remains with us always, so I like to think. Feeling that Hugo is with us in the butterflies, flowers, birds and the bees is a comfort to me. There are times I feel I see little signs – such as a star on the pavement, or this The Boss sign in a window in my old university halls. Last night, Martin and I went to our friends’ home for a barbecue. Our friends have two young daughters, aged 7 and 4. After we’d eaten we settled down to play some board games, one of which was Scrabble. This Scrabble was a Disney version for children, and characters’ names are allowed as part of the rules. That rule led to all sorts of rule bending, particularly as we decided Star Wars should now be included – and surely one of the thousands of stormtroopers must have been called Joe? Anyway, we were split in to two teams – two adults and a child each, with the elder daughter on my team. 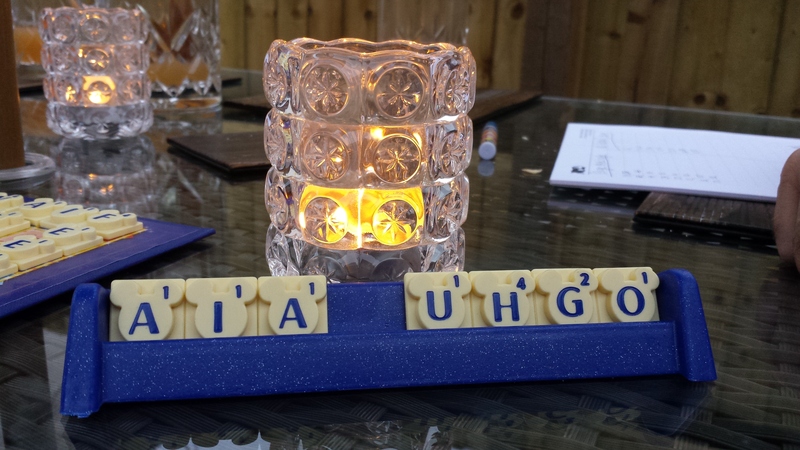 Towards the end of the game, she picked out four letters…an O, a G, a H. She placed the letters on the holder, and I held my breath as she then pulled out a U.
I had a little moment, feeling rather emotional. 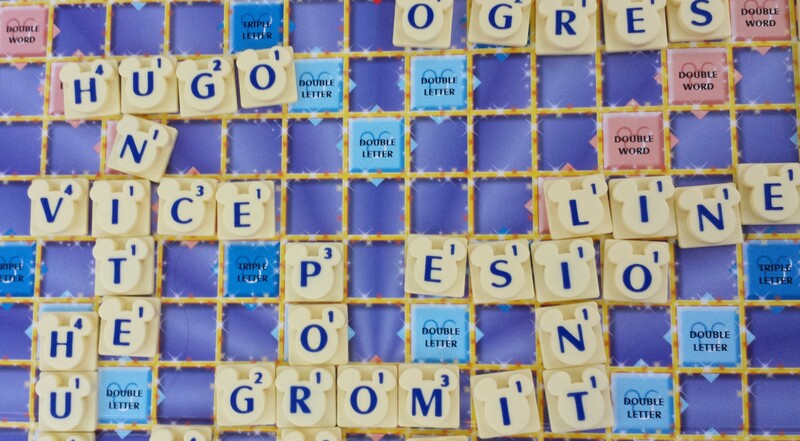 There was even the perfect place to put the letters in our next go. An especially wonderful touch was the seven year old saying she likes to think Hugo is with the angels. Having been in so many situations with grown-ups being unsure what to say, seeing a child being comfortable talking about my son with no hesitation or embarrassment was absolutely lovely. There are 100 tiles in a Scrabble set. Not being terribly good at maths I have no idea what the probability of drawing out those letters, and in that order is. Complete chance, maybe. But I like to think it is Hugo’s way of showing us he was with us yesterday evening, enjoying a special evening with very kind, supportive friends and joining in the fun. I wish more than anything that Hugo was with us still in person. But it is a comfort to know that Hugo is always with us in spirit. 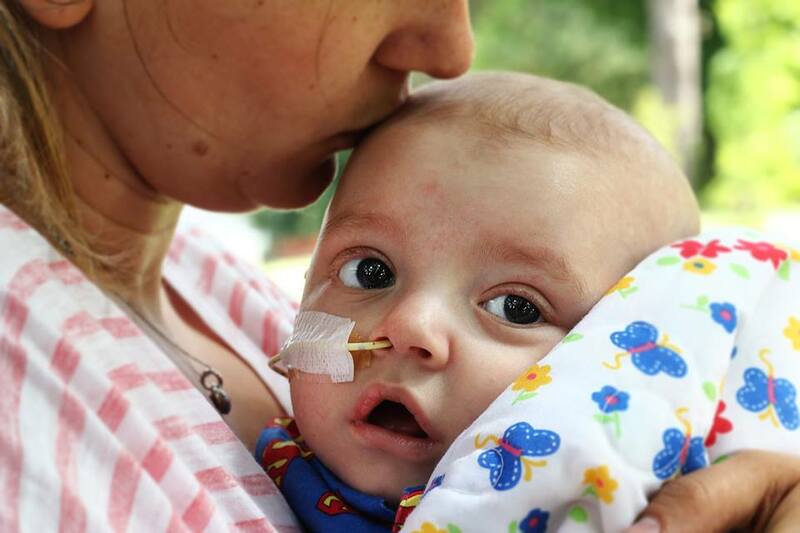 Today’s Sunday Thought is dedicated to a very special little boy, Georgie, his Mummy Oana, and the rest of their family to ask you to #LiveItForGeorgie. 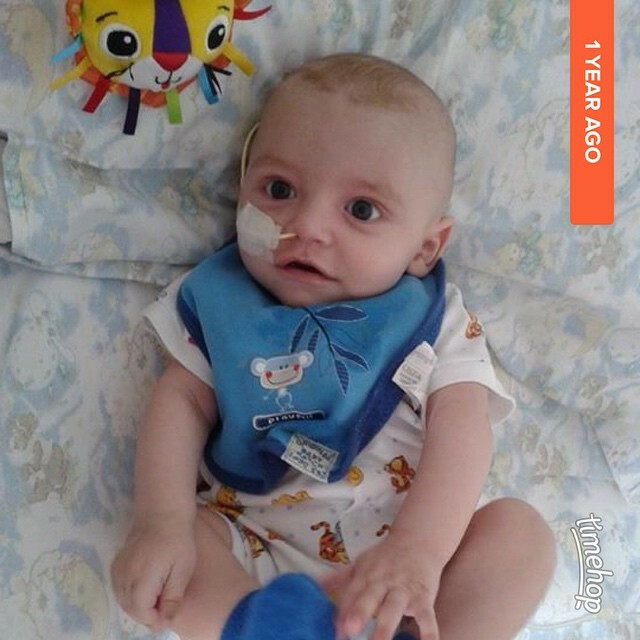 Georgie was born in January 2014, and was tragically diagnosed with leukaemia when he was just three months old. A year ago today, beautiful Georgie left this world. Oana is a special Mummy whom I have got to know over social media over the past year. We bereaved mummies have a kind of shorthand that only we understand, a sense that while our journeys, our experiences are different we get it. We don’t have to explain. 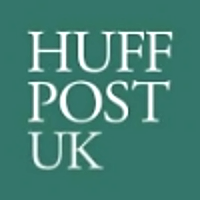 I was delighted to meet Oana at BritMumsLive last month and give her the hug I’ve been saving up for her. We spent time talking about our boys. Hugo’s death made us realise how very precious life is. It made us appreciate what is important in life – and those things are often the simplest, most humble things. Things that Hugo was never able to do, enjoy, or experience. Things that Georgie will never be able to do, enjoy, or experience. That’s why Oana is asking people to #LiveItForGeorgie today. Do something, anything, that you enjoy today. 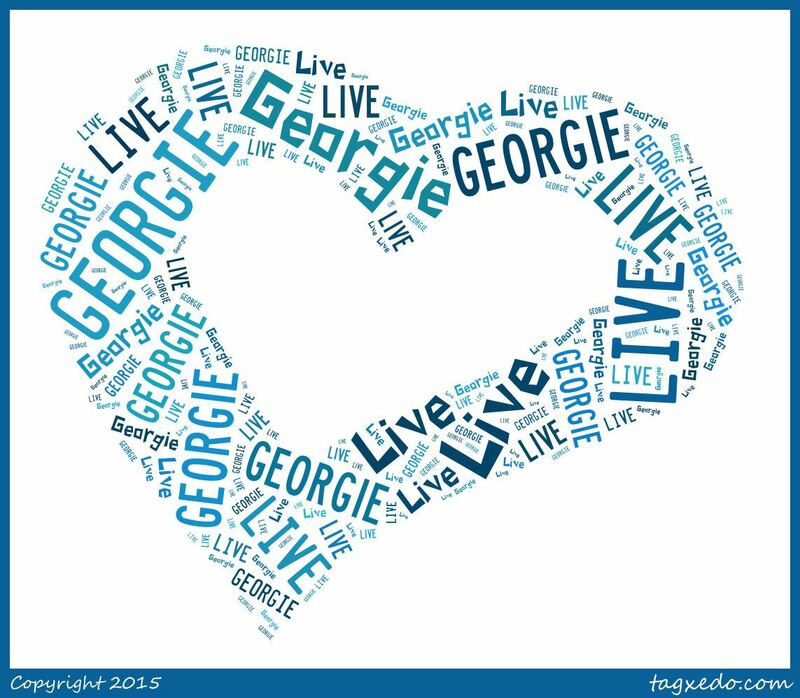 Take a photo and post it on social media (Twitter, Facebook, or Instagram) with the hashtag #LiveItForGeorgie. I’ve already been posting photos of things I enjoy, things that I wish Hugo could be with me enjoying: flowers, eating an ice cream, a stunning field of sunflowers on holiday. The most spectacular sunset. My Instagram photos are compiled in the right hand sidebar of my blog, so you can have a nose if you wish. The things we tend to take for granted will never be enjoyed by Hugo, Georgie, Matilda Mae, Mabel, Anderson, Aneurin, Freddie, Angus, Isabella, Finley, Florence, Abigail, Frankie, Hattie, Flic – and all other babies in the stars. Get out there today. Have fun. Enjoy life. Since Hugo died, a number of lovely people have observed that I seem to be so strong, so brave, so positive. It often feels like a false modesty to say I’m not. Maybe I am, to a certain degree: it probably would have been much easier to have taken to my bed, stuck my head under the duvet and waited for everything to be better again. It wasn’t about making a conscious decision, though. I had to carry on. I had to keep breathing. I had to get up every day. I had to write, to campaign, to channel my anger and energies into something constructive, positive. I have never forgotten, not even for a moment, that I could have died. Nor can I ever forget that Hugo, my precious little boy who gave so much to the world in his 35 days, is no longer here. A positive outlook doesn’t mean someone is ‘positive’, though. To see someone seeming to turn a personal tragedy or trauma in to a positive and thinking that makes them a ‘positive person’ does them a disservice. Because to say someone is ‘dealing with things’ positively, while intended kindly and as a compliment forgets empathy, the vital stepping for a moment in to someone’s shoes. It makes assumptions about what that person’s life is like. It forgets to ask questions. It forgets life is never simple, never black-and-white. It disregards the fact that life after grief and trauma is like riding waves – sometimes the sea is calm, tranquil perhaps. You float along. Sometimes the sea is rough, black as ink, throwing you around as if in a spin cycle threatening to drown you, sharks circling beneath you just waiting for you to give up give in and you will sink down down down deeper deeper deeper until…. You get the picture. The point is the sea is always there. You sink or swim, to an extent. You can prepare all the life buoys, dinghies, boats, transatlantic liners if you like to help keep you afloat. It is a constant fight. There are times when I thought the storm would never end. I am inclined towards positivity, yes. The glass is usually half-full. Trauma shows you what is most important. That means you are unlikely to find me engaging in negative activities – gossip, sniping – or simply things I don’t enjoy. Life after is often about survival. Finite supplies of energy. Focusing on the positive gives me more energy to survive, and even to thrive. But please remember: if you see a bereaved person with a smile, a focus, a purpose, seeming happy even. Try not to tell them they’re doing well. Ask them how they are doing, and listen. Reflect that a positive day might be that day, or even that part of a day – it is not necessarily representative of their life. While I may seem to be positive on the whole, there are times I feel anything but. I know I am not alone in that. The world would be a better place for more empathy, understanding, listening, reflecting. A far more positive outlook. 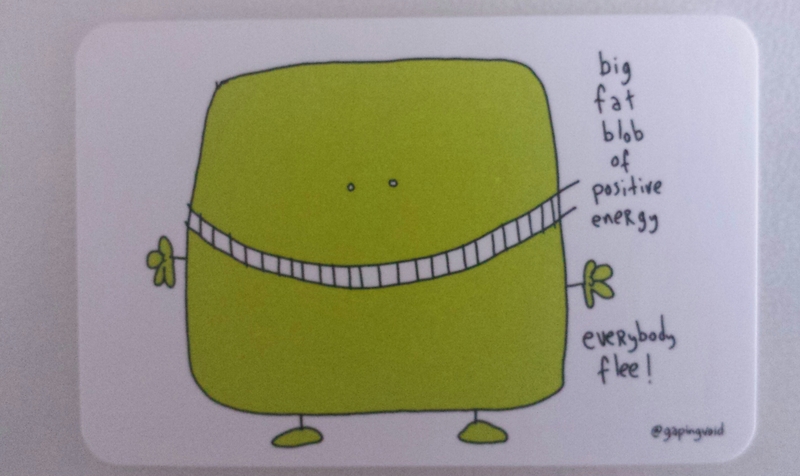 Channelling the messages from my fab business cards (except for the ‘fat’ part, of course).